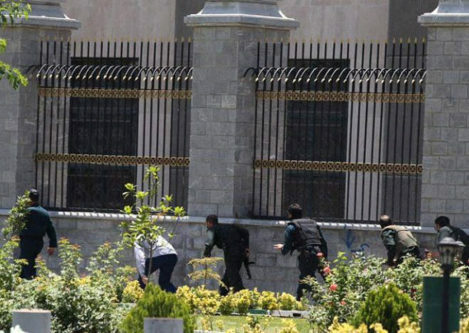 LONDON, (Reuters) – Suicide bombers and gunmen attacked the Iranian parliament and Ayatollah Khomeini’s mausoleum in Tehran yesterday, killing at least 13 people in an unprecedented assault that Iran’s Revolutionary Guards blamed on regional rival Saudi Arabia. Islamic State claimed responsibility and threatened more attacks against Iran’s majority Shi’ite population, seen by the hardline Sunni militants as heretics. He did not explicitly blame any country but the tweet appeared to refer to comments made by Saudi Arabia’s deputy crown prince, Mohammed bin Salman al-Saud, in May, saying that that Riyadh would bring “the battle” for regional influence to Iran. Sunni Saudi Arabia denied any involvement in the Tehran attacks, but the assault further fuels tensions between Riyadh and Tehran as they vie for control of the Gulf and influence in the wider Islamic world. It comes days after Riyadh and other Sunni Muslim powers cut ties with Qatar, accusing it of backing Tehran and militant groups. They were the first attacks claimed by Islamic State inside the tightly controlled Shi’ite Muslim country, one of the powers leading the fight against IS forces in nearby Iraq and Syria. “They are too small to affect the will of the Iranian nation and its officials,” state TV quoted him saying. The powerful Islamic Revolutionary Guard Corps accused Riyadh of being behind the attacks and vowed to seek revenge. “This terrorist attack happened only a week after the meeting between the U.S. president (Donald Trump) and the (Saudi) backward leaders who support terrorists. The fact that Islamic State has claimed responsibility proves that they were involved in the brutal attack,” a Guards statement said. Trump said in a statement that he prayed for the victims of the attacks but added that “states that sponsor terrorism risk falling victim to the evil they promote.” The U.S. State Department and U.N. Secretary-General Antonio Guterres both condemned the attacks. Saudi Foreign Minister Adel Al-Jubeir said he did not know who was responsible for the attacks and said there was no evidence Saudi extremists were involved. Attackers dressed as women burst through parliament’s main entrance, deputy interior minister Mohammad Hossein Zolfaghari said, according to the Tasnim news agency. One of them detonated a suicide vest, he said. Police helicopters circled over parliament, with snipers on its rooftop. Within five hours, four attackers were dead and the incident was over, Iranian media said. “I was inside the parliament when shooting happened. Every-one was shocked and scared. I saw two men shooting randomly,” said one journalist at the scene. Soon after the assault on parliament began, a bomber detonated a suicide vest near the shrine of the Islamic Republic’s revered founder, Ayatollah Khomeini, a few kilometres south of the city, Zolfaghari said. A second attacker was shot dead, he said. The shrine is a main destination for tourists and religious pilgrims. “The terrorists had explosives strapped to them and suddenly started to shoot around,” said the shrine’s overseer, Mohammadali Ansari. By late evening, deputy interior minister Zolfaghari put the death toll at 13, with 43 wounded. The Intelligence Ministry said security forces had arrested another “terrorist team” planning a third attack. The National Security Council’s Seifollhai said Iran had foiled 58 similiar attacks, without specifying a time period. The attacks follow several weeks of heightened rhetorical animosity between Riyadh and Tehran. In unusually blunt remarks on May 2, Prince Mohammed bin Salman, who is Saudi defence minister and a son of King Salman, said he would protect his country from what he called Iranian efforts to dominate the Muslim world. Any struggle for influence between the Sunni Muslim kingdom and the revolutionary Shi’ite theocracy ought to take place “inside Iran, not in Saudi Arabia,” he said without elaborating. The next day Iran accused Saudi Arabia of seeking tension in the region, saying the prince had made “destructive” comments and it was proof that Riyadh supported terrorism. The attacks could also exacerbate tensions in Iran between newly re-elected President Hassan Rouhani, who positions himself as a reformer, and his rivals among hardline clergy and the Revolutionary Guards. But Rouhani said Iran would be more united and more determined in the fight against regional terrorism and violence. “We will prove once again that we will crush the enemies’ plots with more unity and more strength,” he said. In an appeal for unity, Rouhani’s chief of staff, Hamid Aboutalebi, took to Twitter to praise the security services. “Applause to the power and firmness of our revolutionary guards, Basij (volunteer militia), police and security forces,” he wrote. However, two senior government officials, who asked not to be named, said the attacks might prompt a blame game. “They (hardliners) are very angry and will use every opportunity to grow in strength to isolate Rouhani,” said one. The other said the attacks would push Iran toward “a harsher regional policy”. Militant attacks are rare in Tehran and other major cities although two Sunni militant groups, Jaish al-Adl and Jundallah, have been waging a deadly insurgency, mostly in remote areas, for almost a decade. Iran’s Sistan and Baluchestan province, in the southeast on the borders with Pakistan and Afghanistan, is home to the Balouch minority and has long been a hotbed of Sunni insurgents fighting the Shi’ite-led republic. Last year Iranian authorities said they had foiled a plot by Sunni militants to bomb targets in Tehran and other cities during the Muslim holy month of Ramadan.